With an illustrious writing career spanning several decades, Ursula Le Guin’s name is synonymous with the very best and thought provoking science fiction and fantasy writing. The Real and Unreal: Volume 1: Where on Earth? is a collection of her short stories with a common theme of being set in locations that could be the real world. 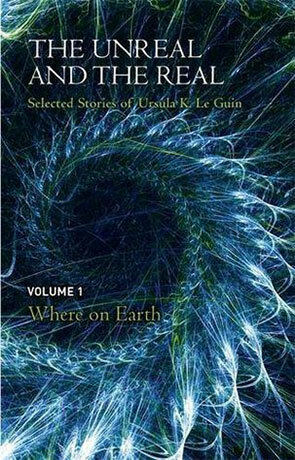 A second volume entitled Outer Space and Inner Lands contains more of Ursula Le Guin’s work that might be labelled as science fiction and fantasy. In the introduction to Where on Earth, Le Guin confesses to having made arbitrary choices in determining the line-up of works. The result does feel a little indulgent in places. The stories vary in style and content. Some are vignettes, descriptions of scenes and activities, whereas others are fully plotted narratives. The tenuous connection between the different works makes it quite a marked change in style and quality between each. To begin, Brothers and Sisters is a well realised short that explores the relationships between two families in a small mining community. Immediately after, is A Week in the Country, which uses a character of the same name to the first tale. The name appears to be the only trait they share, but this doesn’t stop the reader trying to map the qualities of one character onto the other, making for a frustrating experience. However, as the collection moves on, there are some real gems, like Diary of the Rose – an account of a Doctor’s work with an unusual patient and Sleepwalkers – a ten page collection of character perspectives that creates a miniature world just waiting to be explored. The Water is Wide, is another thought provoking gem, looking into the consequences and perceptions of personal madness. With some stories, the perspective switching and lack of paragraph breaks does make the writing difficult to digest. Le Guin writes at length, describe action and location. You never feel a word is wasted, but perhaps more could be done to structure and organise the flow. Occasionally the story premises are strange and dissonant without every really resolving themselves. Within this work, the pieces that work best usually blend this with other techniques to create a textured picture. However, this is a collection that spans four decades of Ursula Le Guin’s work and the smaller pieces are a nice snack for a reader wanting a quick literary bite with lunch. For would be writers, the evolution and application of style in this collection makes for a fascinating insight. Le Guin is a writer who has incredible command of the visual image with her words and when this is anchored with a good plot, it works incredibly well. When it isn’t, the method is much easier to unpick and evaluate, providing a detailed insight into her development over the years. If you are looking at this collection as an insight into the progress of a successful writer, or to find a lost fiction treasure or two this book may suite you. Written on 29th August 2014 by Allen Stroud.